Ganja events - is the work of traitors who dared to encroach on the statehood, said Azerbaijani president’s assistant for public and political affairs, head of department, Ali Hasanov. 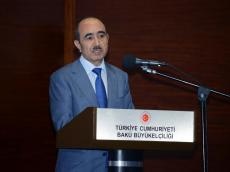 He made the remarks at the Turkish Embassy in Azerbaijan during an event dedicated to the second anniversary of the July 15 coup attempt in Turkey. Ali Hasanov noted the similarity of the events that took place in Turkey, with the events that took place this month in Azerbaijan’s Ganja city. Hasanov also added that the events in Turkey were also reminiscent of the events of January 20 that took place in Baku. Hasanov stressed that the demonstration of the people’s will during the events of July 15, 2016 in Turkey is a source of pride and will remain in the annals of heroism of the Turkish people. The Turkish authorities accuse the leader of the Hizmet (FETO) movement, Fethullah Gulen, who resides in the US, of being involved in an attempted military coup, and demand the US to extradite him. On July 15, 2016, Turkish authorities said a military coup attempt took place in the country. Meanwhile, a group of servicemen announced about transition of power to them. However, the rebelling servicemen started to surrender July 16 and Turkish authorities said the coup attempt failed. The death toll as a result of the military coup attempt stood at over 250 people, and more than 2,000 people were wounded.